If you are looking for the best mobile VR headset but don’t want to spend more than necessary, then this post is for you. In this article and video, we will be comparing the Oculus Go, Samsung Gear VR, and a cheap VR headset (a Google Cardboard headset). With an increasing number of shooters interested in VR180 / 3D 180 cameras, shooters and their audience will need a VR headset. But do you really need to spend hundreds of dollars on a VR headset? 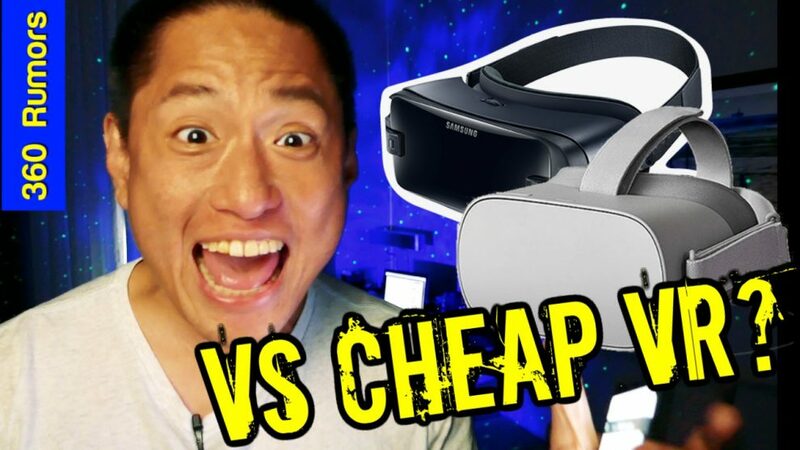 What is the difference between a cheap VR headset, and a Samsung Gear VR or Oculus Go? What’s the cheapest decent VR headset? What is the difference between Samsung Gear VR and a cheap VR headset? There are a wide variety of Google Cardboard VR headsets, and some of them look similar to the Gear VR. Indeed, there are a few that have arguably better optics or better ergonomics than Samsung Gear VR. However, the one common characteristic of all Google Cardboard VR headsets is that they are passive devices that rely on the smartphone for tracking head movement. Samsung Gear VR on the other hand, was optimized for VR in several ways. First, to improve head tracking accuracy, Gear VR has its own sensors, i.e., inertial measurement unit (IMU). Second, when a Samsung phone is inserted into the Gear VR, the phone configures itself to prioritize VR processing. Third, Gear VR uses asynchronous timewarp and a sub-20ms motion-to-photon latency to provide a smooth display that makes the VR effect more convincing. All of these differences mean that the Gear VR can track head movement far more accurately, thus creating a more convincing illusion of virtual reality. With a Gear VR, it is as though the objects that you see in the headset stay in place regardless of how you move your head, thus making them appear to exist independently from the headset. With a cheap VR headset, ghosting, lag, distortion and other issues mean that your mind is fully aware that the images are from within the headset. Which is better: Oculus Go or Samsung Gear VR or Google Daydream? Oculus Go is a standalone VR headset that has access to the same library as Gear VR. Oculus Go, Gear VR, and Daydream are all capable of tracking head movements accurately. The difference between them is in features. Because Oculus Go is a standalone device, it is very convenient to use right away. It also has much less distortion compared to the 2017 Gear VR. Its disadvantage compared to the Gear VR is that the processor is a Snapdragon 821, which is not sufficient for 8K 3D 360 videos. Daydream’s advantage over Gear VR is that it is easier to insert the phone into the VR headset. Special RFID tags allow the VR display to be centered automatically (via software). However, Daydream’s library and user base are much smaller than those of Oculus / Gear VR. Should you buy an Oculus Go? What about Oculus Quest? If you can afford an Oculus Quest, it will be much better than Oculus Go for several reasons. First of all, the Oculus Quest has 6DOF tracking, as well as dual 6DOF controllers. With 6DOF tracking, there is a far stronger sense of presence in VR. Another advantage is that the Quest uses Snapdragon 835, which is the same processor on the Samsung S8 series. This means that it will likely be capable of 8K 3D 360 playback using Insta360 Moment. Based on these advantages, Oculus Quest is clearly the best mobile VR headset, combining the advantages of the Oculus Go and the Gear VR. I currently own a Rift and a Gear VR (using an S8). I am currently waiting for the Quest to get the best of both worlds in one device. The release date cannot come soon enough! Hey there buddy. Really looking forward to it too. I think we may see it first week of May. As I mentioned a while back, I have been using a Nibiru headset for two years now. Paid US$125.00 including shipping from China and this is the one and only headset that I have been using to view 3D 360 and 3D 180 clips ever since. There is no latency, no jitters, no distortion. Lenses are clear so no god rays. It has an SD card slot, micro USB port (for charging as well as connecting flash drive) and even an HDMI in port for connecting an external source. The only flaws are that, being 1080p, there is still a screen door effect and processor can’t play clips above 4K – but that’s the highest I can download from YT anyway. I am following the development of newer headsets but it will take more than the current Oculus Go for me to want to upgrade. As for Oculus Quest, it’s bound to be a plus for gamers or true virtual reality world visits. But for viewing regular 180 or 360 video clips, it makes no difference. Hi Francois. On my s10 if i move my head in a cardboard vr i see ghosting. Same s10 on gear vr i dont see ghosting. Have you tried gear vr? I really recommend that you try it out. Not just 10 seconds but actually try it out. I haven’t tried Gear VR simply because I do not know anyone that owns one. I am just going by your description and pointing out that – much before the Oculus Go was available – I bought a low-cost all-in-one that has worked great and still does right up to today. Certainly not the best it could be but good enough to feel like I prefer waiting till I see a real leap forward in image resolution. But getting back to this “ghosting”, I do not see any ghosting when I move my head with my Nibiru headset. Also i had a friend in Peru. For the longest time he insisted that his bobo vr headset was just as good as gear vr. Until he got a gear vr and realized that actually gear vr is much better. No one i know who has really tried both has said that gear vr is just the same as cardboard. To the best of my knowledge, the Bobo VR is a shell headset. In other words, it requires a phone to operate. This is not what I am talking about. My Nibiru headset is all-in-one. This means it has a built-in processor, display and operating system. When I say “Nibiru” I am referring to the OS which is a VR version of Android. These kinds of headsets are what inspired Oculus to develop the Go. > No one i know who has really tried both has said that gear vr is just the same as cardboard. But I am not talking about Cardboard. I am talking about an all-in-one Nibiru headset, which is what Oculus Go is patterned after. My point is that for US$125.00 postpaid, I got an integrated VR headset that needs no phone and works great. Not saying it’s the best. Just saying the others don’t appear to be so much better that I would want to spend more money on an upgrade just yet. thanks Francois. maybe one of these days i will try the nibiru!